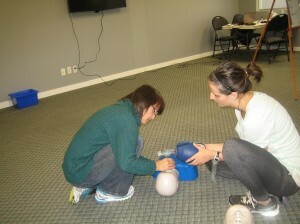 Only candidates that enrol in St Mark James childcare first aid can obtain a CPR level “B” certificate. Childcare first aid must be partnered with CPR level “B”. CPR level “A” – This CPR level is the most basic CPR level. Candidates will learn to perform CPR on only adult and child victims. Course cost ranges from 45 dollars to 90 dollars depending on your region and the price set by the provider. The certificate obtained from this course is valid for 3 years. No re-certification courses are available for this certificate. CPR level “B”– This CPR level is slowly being faded out. Due to CPR training becoming more simple, CPR level “B” training, which includes CPR for adults and children, is no different than CPR level “A”. The same CPR techniques that are applied for a adult can be applied for a child. CPR level “C” – This CPR level is one of the most popular CPR courses available. This CPR course teaches candidates rescue techniques for adult, child and infant victims. When candidates complete the course they receive a CPR certificate that is valid for 3 years. Re-certification courses are available for this course. Health care provider CPR (CPR “HCP”) – This CPR course is the most advanced CPR level offered by all the major providers. Candidates will learn two rescuer CPR techniques with advanced equipment for rescues on adults, children and infants. Candidates that successfully complete this course will receive a CPR certificate that is valid for 3 years. Re-certification courses are available for this course. All CPR courses provided through St Mark James include automated external defibrillator (AED) training. This training is included on the CPR certificate issued through St Mark James. Major providers of CPR courses are located throughout Canada in almost any major municipality. Earn your CPR certificate and build confidence in yourself and learn the skill to preserve life and save life. Find the nearest St Mark James certification provider here.